Christmas Ornament Swan is part of the Holiday Swans Collection. 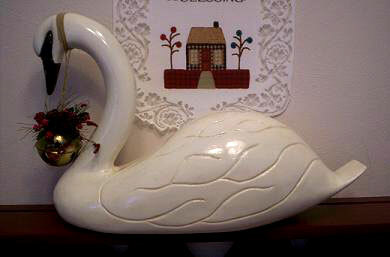 This swan is wearing a sleigh bell greenery ornament w/cloth ribbon hanging from the head. This can be altered to a more traditional look by simply changing the texture and color of the ribbon to satin or wirel. Other ornaments can be added for a more spirtual or festive look, example: angels, mistletoe, bows.